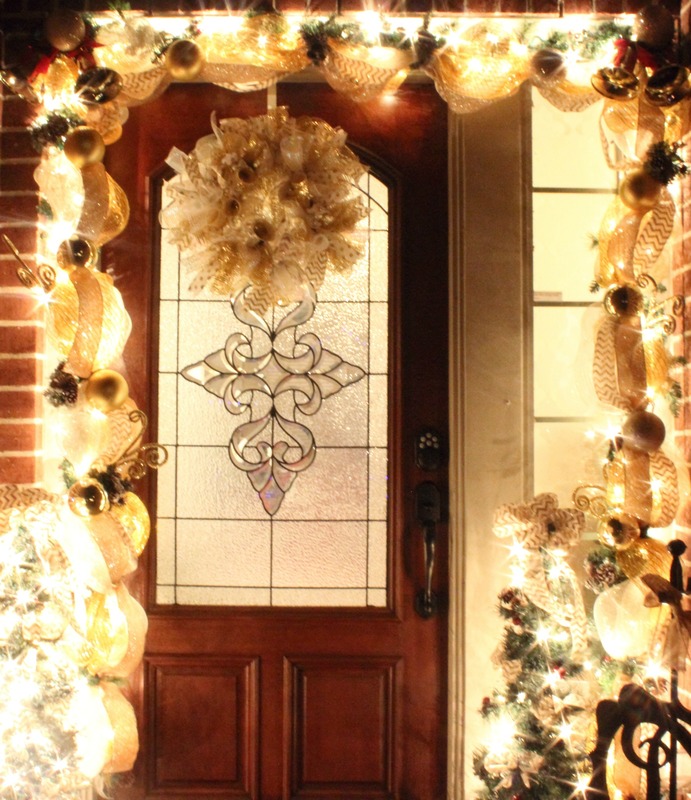 My Christmas Deco Mesh Garland tutorial is one of the most popular posts on my entire blog! 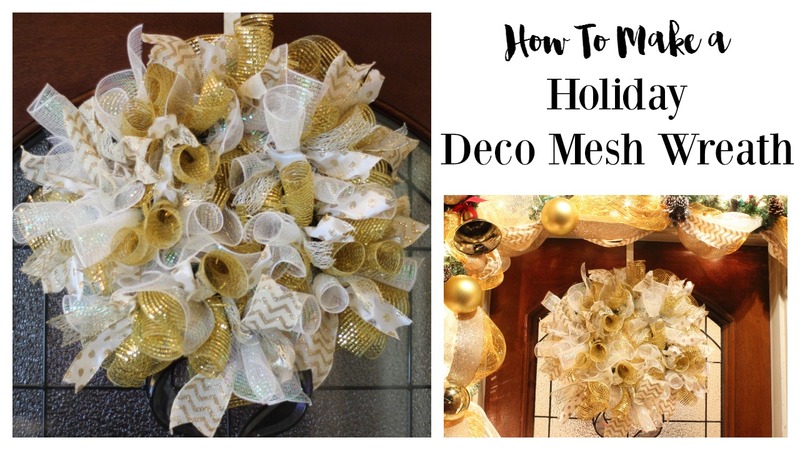 You guys loved it so much I decided to do a post and a video on how to make a Christmas Deco Mesh Wreath to go along with the garland. Be sure to watch the video tutorial on this at the end of the post, and click here to subscribe to my YouTube Channel. 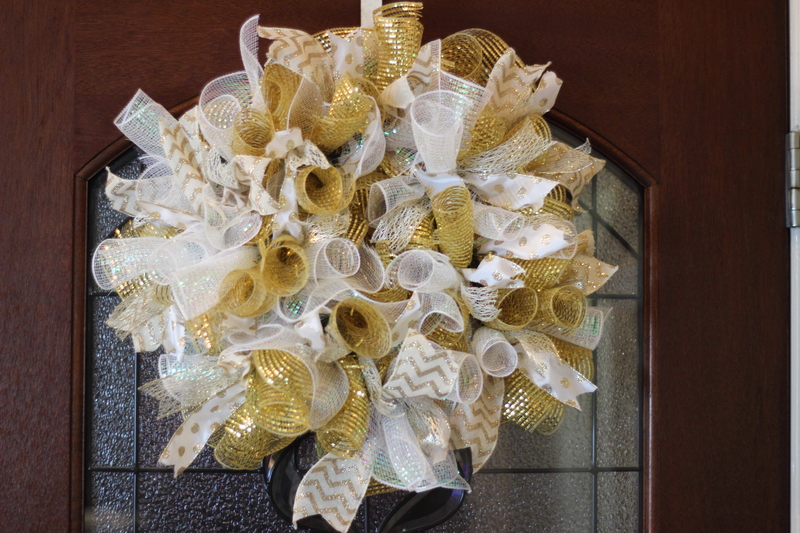 This wreath is also a project that you can purchase from my DIY subscription box Home Made Luxe. 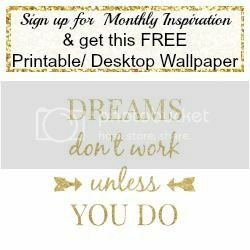 All the materials you need to make this project are included in the box and you can purchase it here. 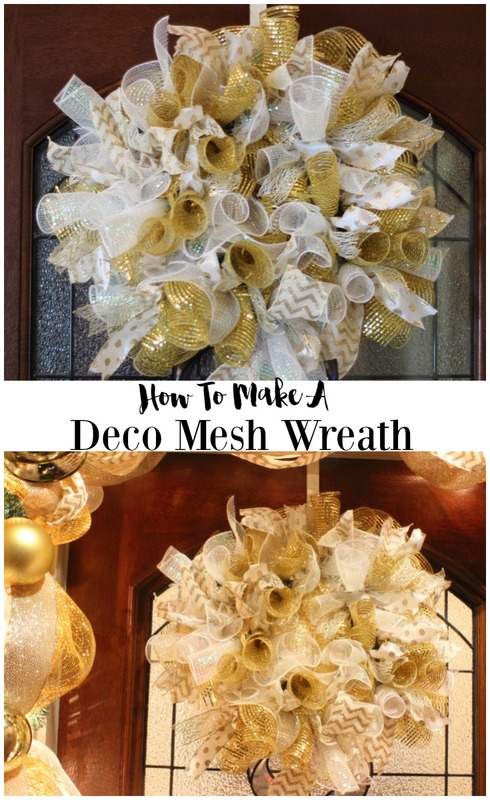 There are so many techniques you can use when making a deco mesh wreath, I will teach you two in this tutorial the ruffle and the spiral deco mesh techniques. 10″ Burlap Pencil Wreath form (for the purpose of this tutorial I used a green wreath so you see the instructions better but you would want to purchase a color corresponding to your ribbon so it blends in with the finished wreath. Cut the Burlap Mesh into 10″ lengths so that you have 10 by 10 squares. Make it easy on yourself by laying both deco meshes on top of each other so you can cut them both at the same time. The first technique we will use is the ruffle technique. 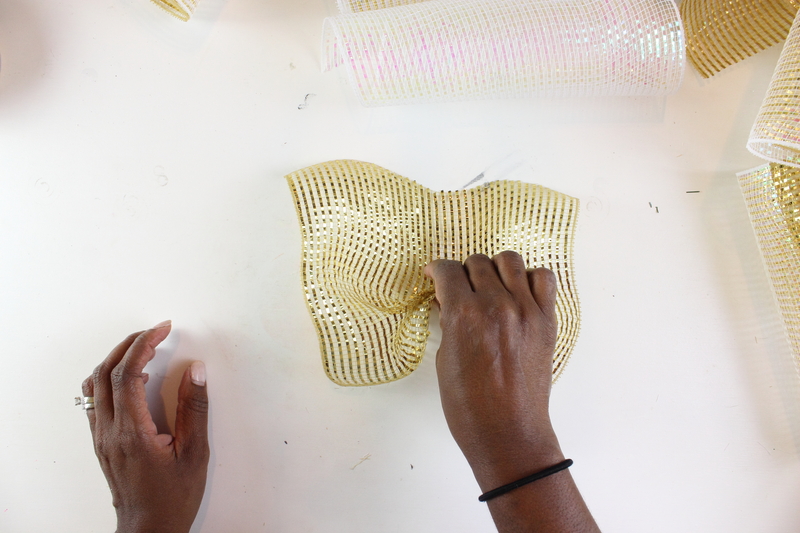 Make deco mesh ruffles by simply laying the mesh down and scrunch or gather up through the center of the mesh with the finished edges on the sides. 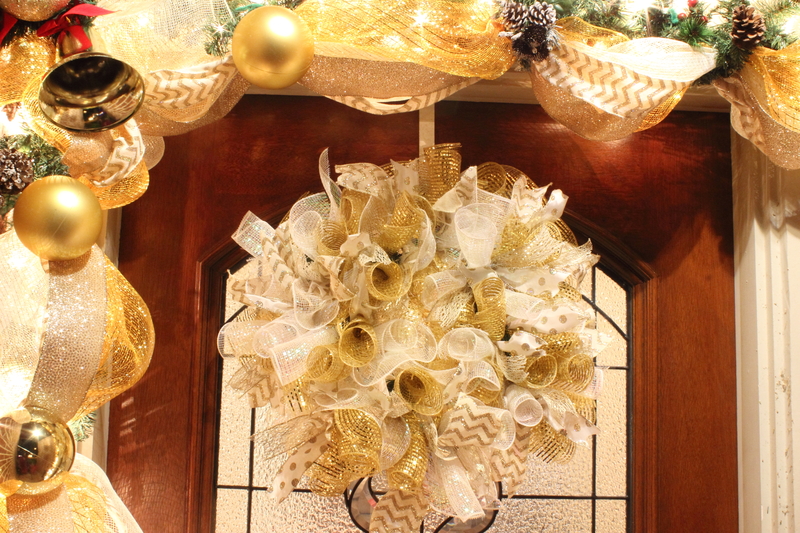 Create 2 or 3 of these ruffles in a cluster and secure together in one of the twist on the wreath. 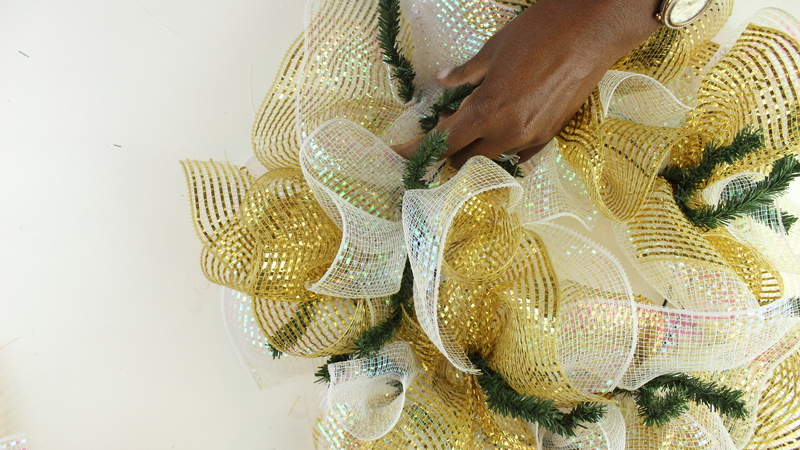 It doesn’t matter if you start on the inner ring or outer ring just continue to add 2-3 ruffles to each twist on the wreath until the entire wreath is covered. Try to alternate which color ribbon is on top. 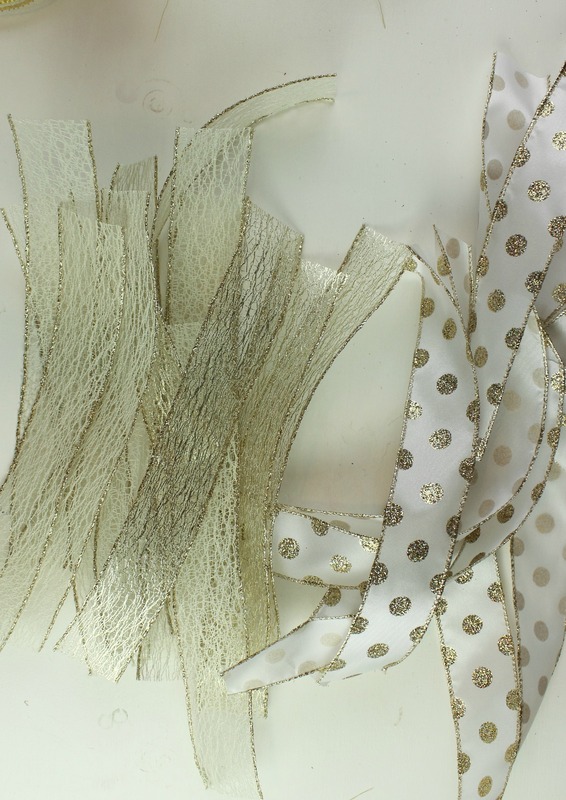 Be sure not to twist too tightly on the twists because we will have to open these up later to place more ribbon. Now lets use technique number two to make your spirals. 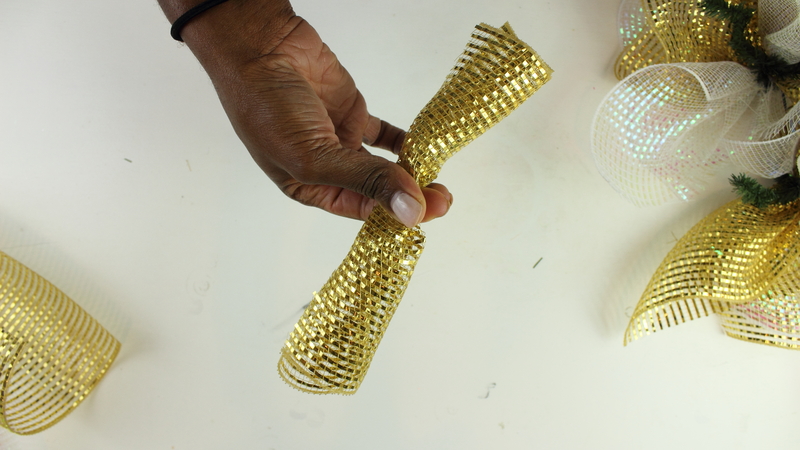 To create your spiral simply follow the natural curl of the deco mesh square and curl tightly, again the finished edges should be on the sides. Be sure to undo your twist and place your spiral, then tie to secure. Use your scissors to clip any frayed edges and strings. 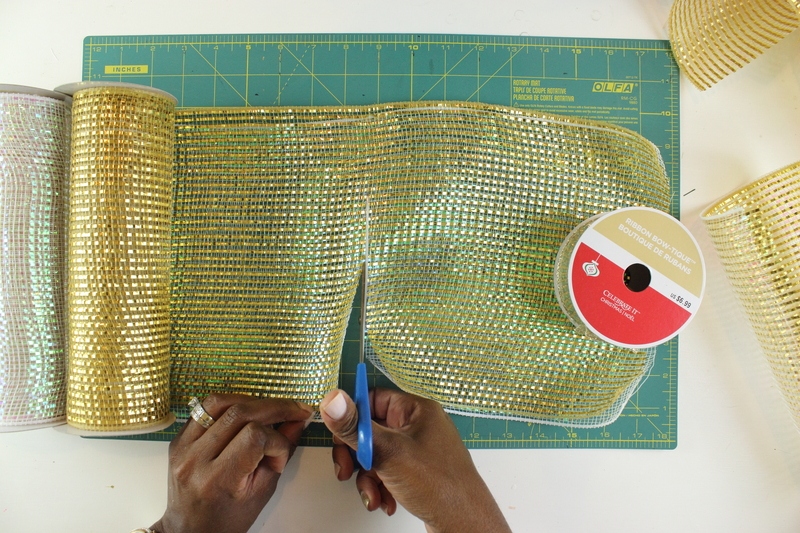 Next cut your ribbon into strips about 12″ strips works well, but test out lengths until you get your desired look. Cut the ends of your ribbon to get a duck tail. 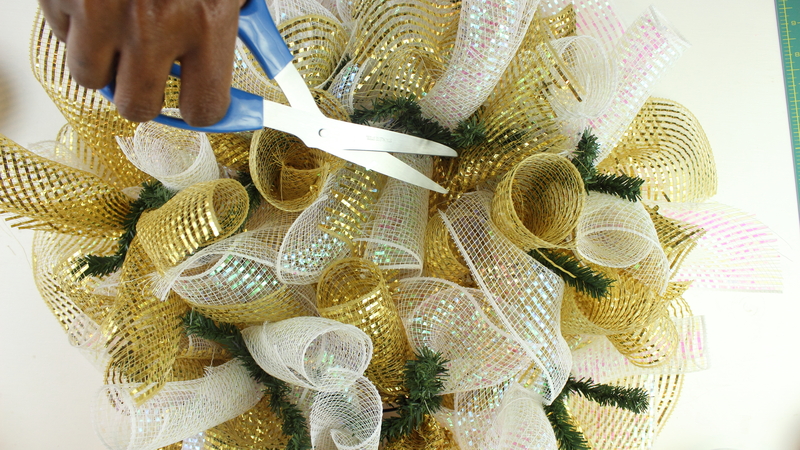 gather two pieces of ribbon at the center and again untie the twists and secure to the wreath. Continue until you have added ribbon to each twist. 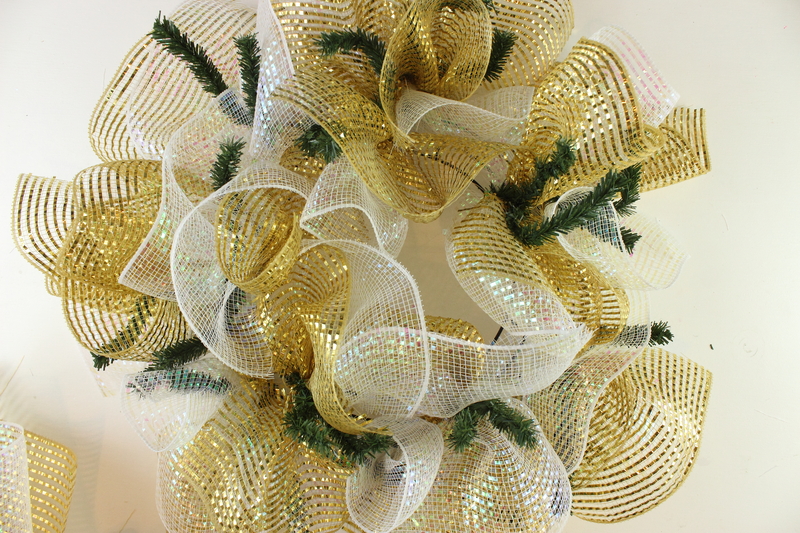 Fluff and enjoy your wreath. 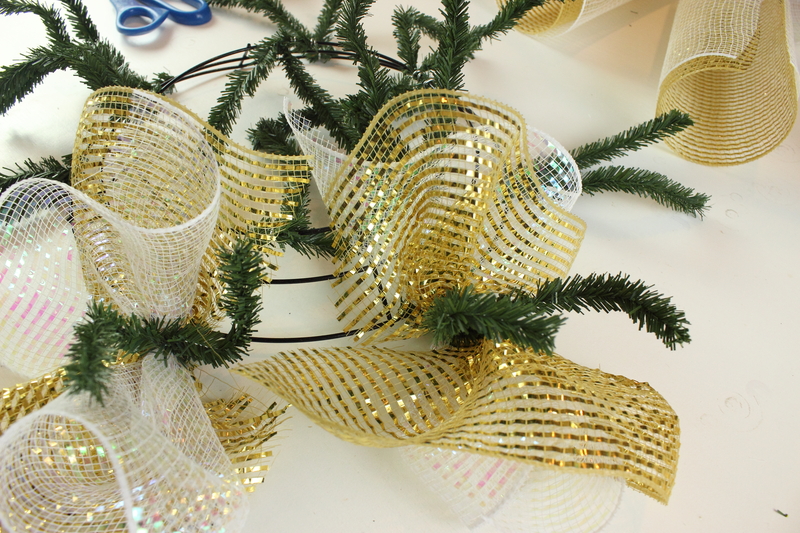 Click here to view the deco mesh Garland video and tutorial so you can make that as well.